When you hear the words “Self-Care” do you immediately think “I have no time”, or “It’s selfish”, or “$$$”, or “Massage-bubble-bath-facial-flowers”, or “Time-out, which is impossible” or maybe you feel guilty about it? Or perhaps it’s just that the term ‘self-care’ sounds too new-agey. All these responses are signs that guarantee you will miss out! 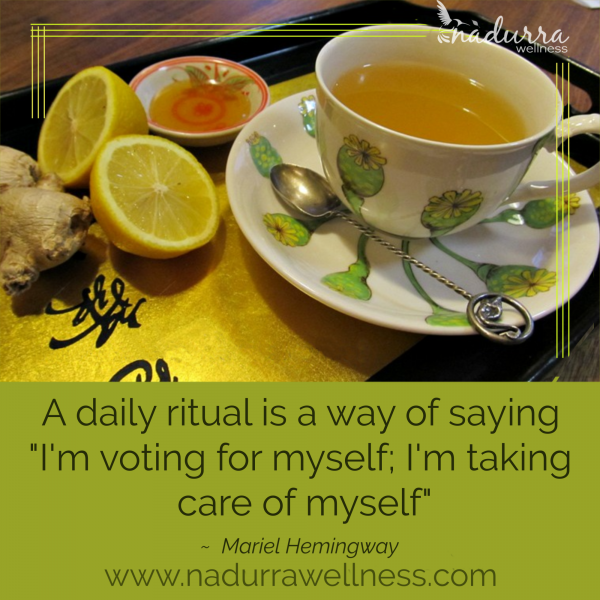 Self-Care rituals are nothing more than looking after your own needs at a grass roots level. When you resist, you miss out on practices that keep you grounded, supported and energised. And that means you will keep getting sick! I’ve been a natural health practitioner for over 18 years. While my clients come with a specific health problem, most also have issues with stress and a lack of self-care lurking in the background of their health issues. I provide natural remedies and techniques to support and help them. But until they also address that elephant-in-the-room they keep on getting sick! Conscious self-care is not about the indulgent practices we love, but only do occasionally. It’s about the small everyday practices – rituals if you like – that you can do as a part of your daily routine, that leave you feeling good. They’re the things you WANT to do, because they nourish you and change the way you interact with the world. Because they make you feel so good you’re willing to commit the time to fit them into your day. Self-Care is very personal and individual. What grounds and energises me won’t do the same for you. For you it may be journaling before you go to sleep. It could be taking the dog for a walk in the early morning. It might be scheduling a gap in the afternoon to sit in a sunny spot with a cup of tea. Or it may be a soak in the tub, or even a nap. Self-Care rituals looks different for every person. For me Self-Care means spending time out in my garden every day – even if that’s just a few minutes. It’s about the connection with the natural world which awakens me and makes me feel alive when I’ve been tapping away at the computer for hours on end. When I don’t make the time for my practices I quickly start to get sick in body, mind and soul. But it was only after I’d made these practices a regular part of my normal day that I noticed the connection. It’s easy to know the importance of deep Self-Care. But it’s another thing altogether to change the thinking that stops you making it a regular part of your life. That’s not so easy. First it means you need to start saying “No” to others. That itself can be a major stumbling point where you quickly find any excuse not to start. When you haven’t ever honoured your own needs first it’s difficult to grasp the benefit that reversing this behaviour and attending to your own needs brings. Until you actually do it, it may be impossible to realise how much better you will feel and function once Self-Care becomes part of your day. It’s important to work out what actually does leave you feeling empowered and ready to forge on, even if life is hectic. And once you do, you need to commit to it. Schedule it in your calendar if you must, whatever it takes to do it everyday. Your ritual may be waking earlier to meditate or simply to sit in the blissful quiet before the family rises, with a tea or coffee. You’ll know when you’ve nailed your deep Conscious Self-Care practice because you’ll WANT to wake earlier just because it makes you feel SO good. As I mentioned it can be difficult to get that Self-Care routine going. Sometimes when you want change, what you need to do is disrupt the normal patterns of your everyday life. That’s where a retreat can be perfect. Time away – especially if it’s a week or more – breaks apart the obligation and pressure of everyday responsibilities. A retreat gives you the space to make conscious intentional choices about how you treat yourself. It gives you the space to make your Self-Care real, rather than Self-Care as unrealistic indulgences that happen randomly at best. Although, indulgences will likely be a bonus inclusion on many retreats. On retreat you create a new way of thinking, where you not only KNOW you need to look after yourself first, but you frame a new way of thinking and action where YOU DO IT! Would you like to move beyond Self-Care to a place where you have time to ground and energise yourself, and to find the time and energy for others? Join me in Vietnam in March 2019 for 11 days of ‘Self-Care Made Real’.